YOU MUST HAVE HEARD about the “folded napkin” in the Gospel of John. 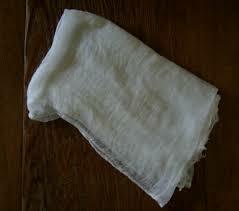 A story involving the napkin is part of the greater story of the Resurrection of Jesus. But an anecdote also had formed around it. In the ancient near east it is said that when a master leaves a folded napkin on the table the gesture would inform the servant that his master was coming back – presumably to finish his meal. The anecdote then gladly announces the significance of the “folded” napkin for the Christian believer: the risen Christ left a “folded” napkin to signify to the Church that He is coming back! Boom! Leave the folded napkin right there. Right? Sorry, but there is no mention of a napkin there – where we would expect to see it, if we went by the anecdote. So why do we read of the “folded napkin” instead in the Resurrection event in John’s gospel? I believe John gives us the explanation. Observe the correspondence of thought or idea between A1 and A2 in the above chiasm: Both tell us about Peter and John. In the first (A1) John outruns Peter; in the second (A2) Peter will die first. Note the reversal of ideas: John arrives first before Peter; Peter dies first before John. It is John who arrives first at the tomb but he pauses at the mouth of the grave and looks in. Peter, however, walks past John right into the tomb and he saw what he needed to see: the folded napkin – “the cloth was folded up by itself, separate from the linen” (20:7b). It is important to point this out. According to the Gospel of John it was Peter[vi] who “saw” the folded linen. But the folded napkin was inside the tomb, not in a dining room. So why Peter? If my reading of the literary structure John 20 and 21 is correct then the chiasm of the post-resurrection passage tells us why. Peter saw[vii] the folded napkin (or cloth) lying separately from the linen (C1) corresponds to Jesus talking to him separately, asking three times: “Peter, do you love me more than this?” (C2). We find the explanation for why it was Peter who saw the folded napkin later on in John’s development of the post-resurrection appearances narrative. Let us understand what was happening here. Three persons had been to the tomb that early morning. Mary Magdalene was the first. She must have been shocked when she did not find the body of Jesus in the tomb. She rushes to tell Peter and John: “They have taken the Lord out of the tomb, and we don’t know where they put him” (v2). The Lord, now risen from the dead, returns and seeks out Peter to “finish” what he had earlier left aside to do as signified by the “folded napkin”!This is the point the chiasm makes concerning the folded napkin! I must confess that I find the story compelling! I think there is a wonderful finale to this story about Peter and the folded napkin. After Pentecost Luke records that Peter and John were on their way to the Temple for the hour of prayer (Acts 3:1-26). Then they meet this lame man who begged them for alms, which Peter and John did not have. But they were ready to give the man what they had. [xii] Peter then commands the man: “In the name of Jesus Christ of Nazareth, rise up and walk!” The lame man stood up and began to jump around to the amazement of the people. And- Peter found the opportunity to explain what the miracle meant for those who gathered around them. “You disowned[xiii] him (Jesus) before Pilate,” Peter reminded the people (3:13). “You disowned the holy and righteous one,” he repeated (v14). Then he said, “I know you acted in ignorance, as did your fathers” (v17). What did Peter want the people to do? “Repent, then, and turn to God, so that your sins will be wiped out” (v19a). And then what would happen next? “Repent… that times of refreshing may come from the Lord…. When God raised up his servant, he sent him first to you to bless you by turning each of you from your wicked ways” (v19b,26). [i] This was my “comment” to a Facebook post about the “folded napkin” that was sent to me by a friend. [iv] I have written previously about chiasms in Scripture. See also Richard Novick’s published writings in this website. A chiasmus is a literary device of parallelism in which words or thoughts expressed in the first half of the parallel are repeated in the second half, usually in reverse. Chiasmus is a literary technique to make a larger point. [v] The way to “read” a chiasm is to identify the parallel words or ideas within a given passage of Scripture. Correspondence is the hallmark of chiasms. In the chiasm of John 20 and 21 the first thing to note is the correspondence between A1 and A2, followed by B1 and B2, then C1 and C2 and finally the chiastic middle, D. This type of chiasm points the reader towards the middle where it makes a larger point. [vi] John later follows Peter into the tomb. The text does not make clear if he also noticed the folded napkin. John refers to himself in the third person: “Finally the other disciple, who had reached the tomb first, also went inside. He saw and believed” (v8. All scripture quotations here are from the NIV). [vii] This is not a “glance.” The Greek indicates keen observation (Gk: theorei, “he saw”). Peter noted the details. John also “saw,” but the word used is blepei (“he saw”). [viii] And the rest of the disciples; see John 20:3. [ix] Mark, Peter’s companion, records the post-resurrection instruction of the angel with an important detail not present in the other Gospels: “You are looking for Jesus the Nazarene, who was crucified. He has risen! He is not here. See the place where they laid him. But go, tell his disciples and Peter…” (Mk 16:6,7a, emphasis mine). [x] Although Jesus is the Master and Peter is a servant Jesus appeals to Peter on the ground of love. “Simon, son of John, do you truly love me more than these”? See also: “Greater love has no one than this, that he lay down his life for his friends. You are my friends if you do what I command. I no longer call you servants, because a servant does not know his master’s business. Instead, I have called you friends, for everything that I learned from my Father I have made known to you” (Jn 15:13-15). [xi] Peter’s denial is recorded in each of the Four Gospels (Mat 26:69-75; Mk 14:66-72; Lk 22:54-62; Jn 18:15-18,25-27). [xii] Peter was confident that he has been received back into the fold! [xiii]Greek ernesasthe. Same verb used in Peter’s denial of Christ in Mat 26:70; Mk 14:68; Lk 22:57; Jn 18: 25,27.